The popular travelling website Tripadvisor was flooded with enquiries about which is the best place to go for snorkeling, is it Akumal or Cozumel. Read on to find out which destination you should consider visiting. In Mexico, there are many spots where one of the major attractions is to go for snorkeling. One of them is Puerto Morelos. It is the easiest and while all snorkel experiences change with conditions, Puerto Morelos is quite same. There is so much to see and one can go out by boat which is cheap. The reef in Puerto Morelos is shallow and you can be closer to nature. Then there is Cozumel famous for diving. But Akumal is famous for turtles when compared to Puerto Morelos and Cozumel. The little beach town of Akumal attracts tourists who love snorkeling with endangered green sea turtles. Interestingly, you don’t need to rent a boat or even a guide to go snorkeling with the turtles like in the case of Puerto Morelos. Turtles are a short swim away. The ocean floor at Akumal is covered with sea grass, one of the turtles’ favorite foods. The turtles hang out there for hours in the bay, casually munching on the grass. Aside from turtles, there isn’t much other marine life in the shallow waters of Akumal Bay. You can reach Akumal for a wonderful experience from Playa del Carmen by collectivo. Collectivos are small, so if you have a lot of luggage, you may want to take a bus or taxi. The collective from Playa del Carmen will usually drop you off by the pedestrian overpass on the highway. Cross over the overpass and keep following the road and you’ll be on the beach. If the collectivo drops you off in Akumal town, you will have to just follow the road back across the highway. Another option for getting to Akumal from Playa is to take a bus. The ADO buses do not stop in Akumal, so you’ll need to take a second class Mayab bus. After reaching Akumal, you can rent snorkels, fins and masks right in the bay. You’ll need to bring your own towels, ID and a deposit. The dive sites also rent lockers. 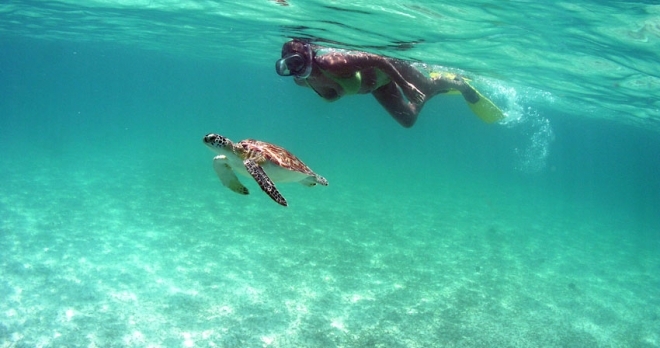 So, get your snorkeling gears and dive in to enjoy the clear waters with turtles. Interested to get a glimpse of local people and culture or just relax and forget all your worries, Akumal might be the place you want to visit. Hop over in any taxi or just for the thrill go on a hop-on hop-off bus that’s very inexpensive named colectivo to reach Akumal. It is just over an hour’s drive from the resort city of Cancun, Mexico, and about a half-hour from Playa del Carmen. 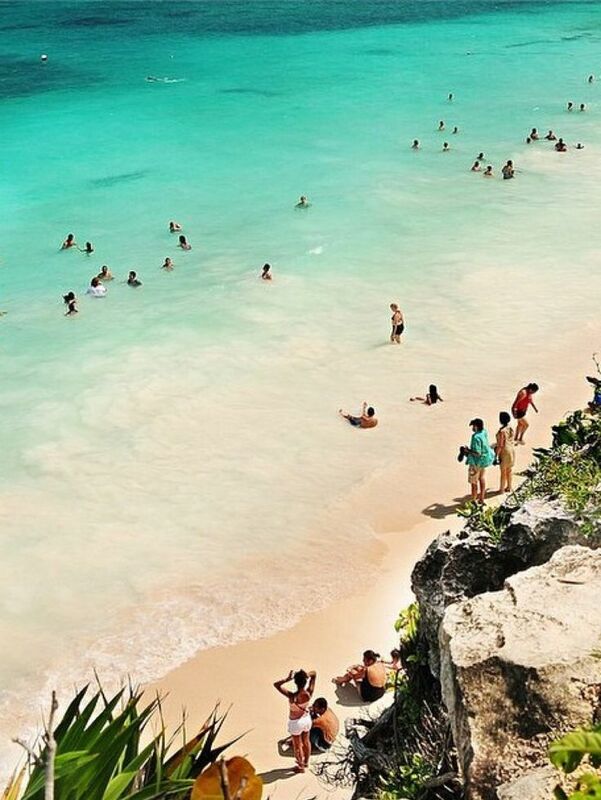 Cancun is best known for its beautiful beaches and fruity drinks. Most of the tourists head for Cancun due to its lavish luxurious options. But as Akumal is strategically located about twenty-minutes from the famous Mayan ruins of Tulum you cannot give the place a miss. The spectacular Mayan ruins of Coba are about an hour-and-a-half away. Along the way, you’ll find stops for beautiful cenotes – a Mexican version of an underground swimming hole – in which to take a dip. In fact, there are three wonderful ones right near Coba. Located on the Caribbean Sea, Akumal Bay is breathtakingly beautiful, with lots to do. Depending on where you stay, you’ll find different activities to suit your taste. Stay in a resort on the main bay if you are fond of luxurious larger hotels, jet-ski rental, beach-bars, parasailing and more. Stay at a place on North Akumal Bay and you’ll experience a more serene experience, quite opposite. On North Akumal Bay you’ll have a choice of staying at small, boutique-like properties, as well as renting condos and rental homes. Even you can find fabulous restaurants with delicious food where the flooring is the actual sandy beach. Akumal means “place of the turtles” in the Mayan language. The beaches to the north and south are endangered Green Sea Turtle habitat. The Centro Ecologico Akumal (CEA), local NGO, educates residents and visitors about habitat preservation. Yal Ku Lagoon, to the north is a haven for snorkelling; an area where fresh water percolating through ground limestone meets salt water and creates nutrient-rich habitat for marine life. Just a short swim out and you’ll have one of the best views in the area; colourful fish and beautiful sea turtles! Be it food, surroundings or the people, Akumal has it all just to enjoy and relax. Let yourself loose to soak up the feeling. Is There A Fee For Swimming With Turtles In Akumal? Recently someone posted a query on TripAdvisor asking about the latest snorkeling requirements in Akumal for turtle watching. Is there a fee for swimming with turtles in Akumal? If yes, how much is it and whom does it need to be paid to? Akumal is a public beach and hence there is no fee for swimming with turtles in Akumal. But you need to be wary of some aggressive beach vendors who will desperately try to sell you a tour. This can be slightly intimidating for all those people who are visiting Akumal for the first time. It is best to avoid these vendors by just walking south along the beach, saying ‘no, thank you’. Also, it is not compulsory to hire a guide. You can just head to the dive shop, rent in your snorkeling gear, life jackets and lockers and get going to see loads of turtles, fish, sting rays, and the beautiful coral reef! There are signs on the beach stating ‘ lifejackets must be worn’. Though wearing one is not compulsory, it is always advisable to have a life jacket on in case you are not an experienced snorkeler. Also, there are no rules as to where you can get in and how far you can swim. There is a lifeguard on duty who will politely encourage you to stay within a reasonable distance.